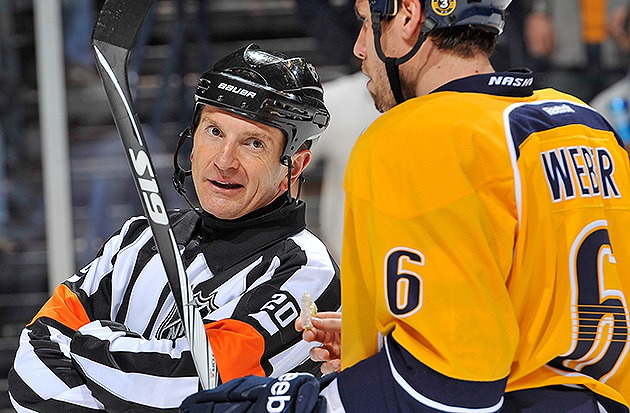 Tim Peel is an Olympic referee; what’s Russian for ‘blown call’? If you know an NHL referee’s name, chances are he’s (a) been around for three decades or (b) has a personality that’s memorable, like a Paul Stewart or Kerry Fraser or (c) is completely terrible at his job, like Tim Peel. • Blowing a goalie interference call on the Ottawa Senators in the Eastern Conference quarterfinals, which prompted Henrik Lundqvist to question whether the referee (TIM PEEL!) wanted the Sens back in the game. • Blowing a tripping call on Corey Perry that allowed the Ducks to defeat the Carolina Hurricanes in overtime, as Eric Staal said, "It was unfortunate in overtime to have a call like this go against us." • Giving Radko Gudas of the Tampa Bay Lightning a game misconduct for breaking his stick on the bench after getting squirted by a water bottle. Look, I don't want to say Tim Peel is terrible, but that's mostly because he's actually atrocious. In the grand tradition of failing upward, Peel has been selected as a referee for the 2014 Sochi Olympics men’s hockey tournament, one of 13 NHL officials who have made the cut. The others: Dave Jackson, Mike Leggo, Brad Meier, Kevin Pollock, Ian Walsh and Kelly Sutherland. The linesmen are Lonnie Cameron, Derek Amel, Greg Devorski, Brad Kovachik, Andy McElman and Mark Wheler. Look, maybe we’re being a little too harsh on Tim Peel. I’m sure if you looked hard enough, you could find Facebook pages and Twitter parody accounts in honor of Kelly Sutherland. Or not. So brace yourselves, Sochi, for the thrills and chills of bizarre overtime penalties and chronic misinterpretations of goalie interference rules. Just remember what NHL fans have known for years: You can’t appeal a Peel.